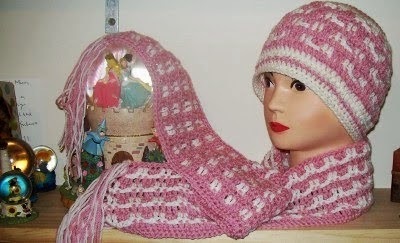 Firstly let me say that this is not my pattern you can find it here and thank you so much RoboTrish for supplying this pattern for free. 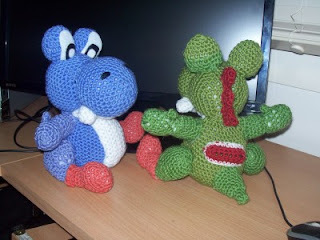 I took pictures all the way through whilst making 2 Yoshi's at once, I am hoping that they may guide some-one that is either new to crochet or new to making an Amigurimi. 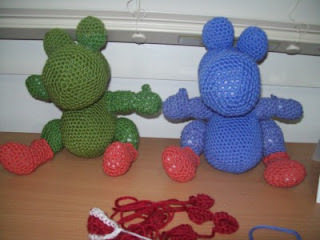 Here are the finished pair which I made for my 2 of my grandsons, they are both Super Mario fans. What I did first was to copy and paste the pattern to a word document on my computer, then I enlarged the font for easier reading. 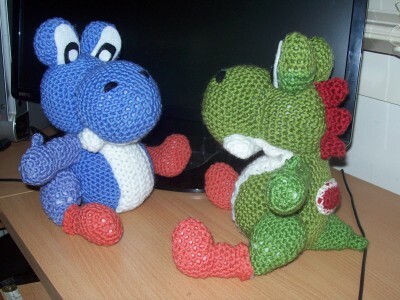 Then I did a google image search for pictures of more crocheted Yoshi's, copied and pasted the pictures to the same word document, these pictures would now be my visual reference. 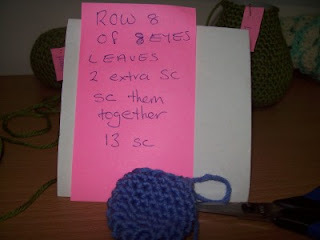 After you have made your 6 sc in the magic ring, pull yarn tight but not too tight, after you have made your 12 sc on row 2, pull the yarn tighter to close the ring. 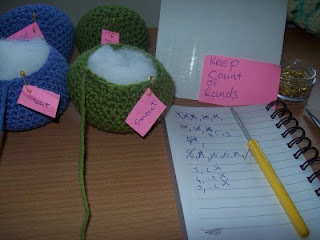 It's very important to keep count through out the entire pattern. 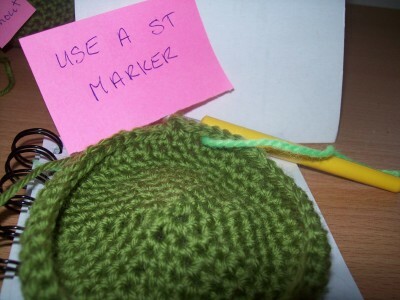 Using a st marker is a necessity. A view of the stuffed body shape. 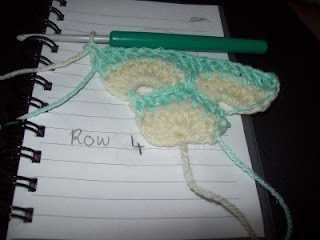 I found that on row 8 of the eye's the st count is out by 2 extra sc, so I just crocheted them together, no big deal. 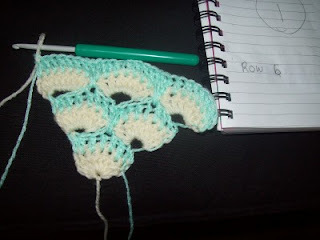 I think the next row will be out by one as well. So here are the eye's stuffed. Looking good. This is what the thumb looks like when you make it. Row 7. 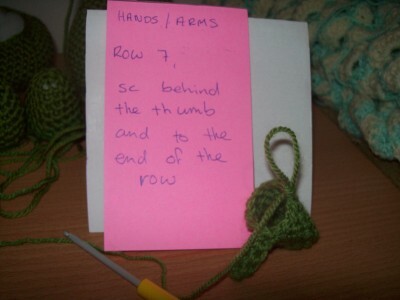 Count carefully around this row when you go into the sc's. 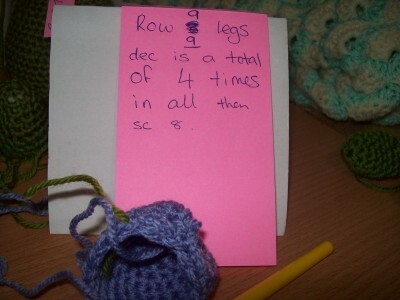 I got a little confused on this row and the next row, but the decrease is a total of 4 times in all. 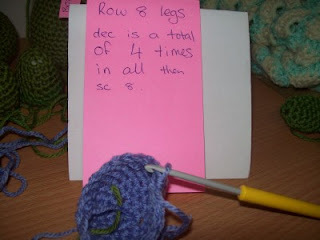 Row 8 of the legs. Row 9 of the legs. 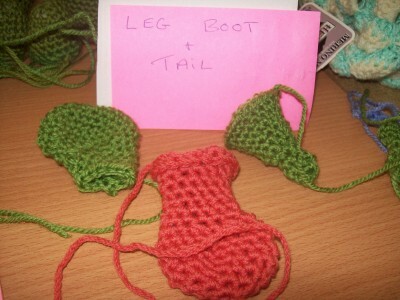 What the leg boot and tail look like. 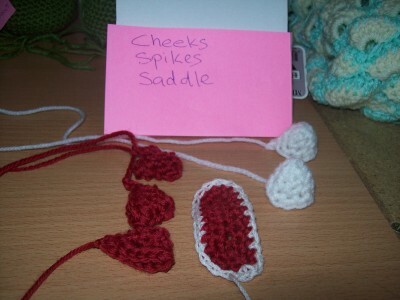 The cheeks, spikes and saddle. 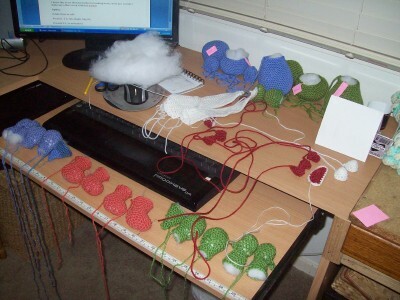 Here are all of the pieces for my 2 Yoshi's, now to sew them all together. 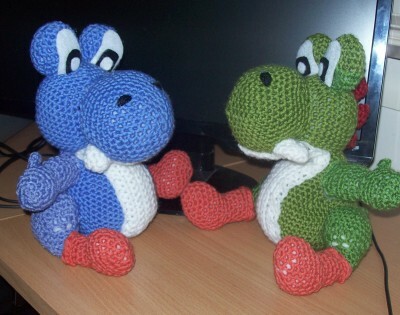 They look slightly naked here. 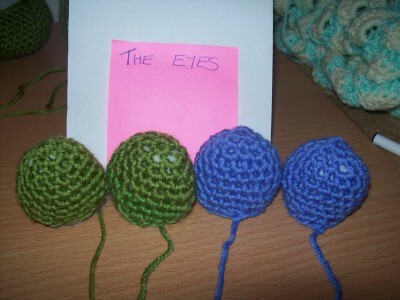 Here they are eye's and all a front and side view. I used felt for the eye's and glued them on with craft glue which dry's clear. 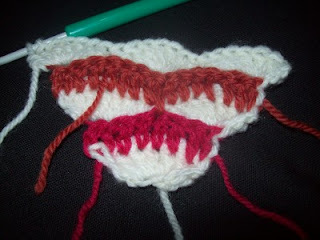 And a view from the rear. I hope my pictures may help some one who does make the Yoshi, if you can do a sc and read a pattern, I'm so sure that you could make one, so why not try it. 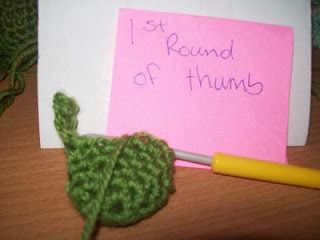 Good luck and thanks for reading my blog. 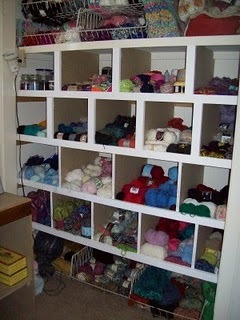 A wardrobe in my craft room was converted to storage space for my yarn. 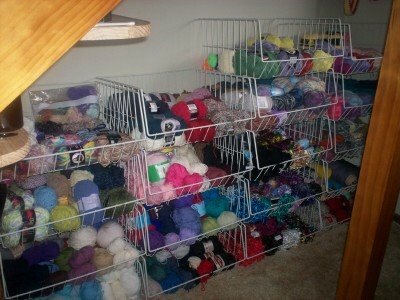 This was my previous yarn storage solution. 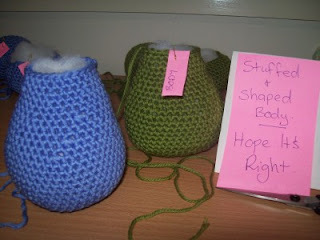 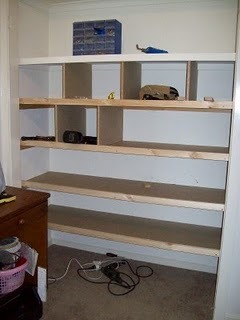 Check out this link for further yarn storage solutions. 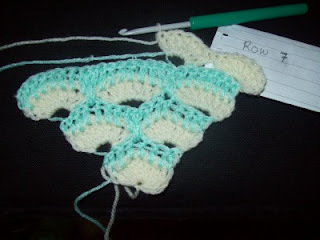 Pictures begin from row 1.
you could call this the dip part. The view for the 1 sc in the 4th dc of 2 rows below. 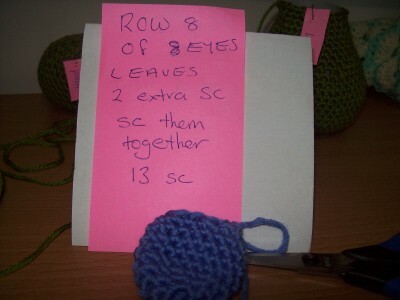 Pattern Instructions by Lisa (AKA CrochetQuackers), but some changes are made by me to follow the method in which I made mine. 8 ply yarn, mint and white, or your choice of colors, (US yarn = baby). 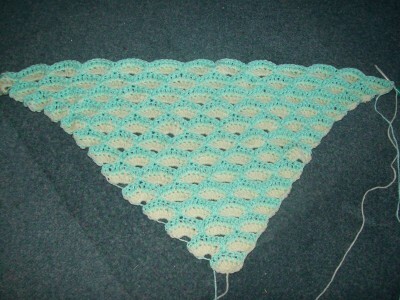 Pattern begins at the bottom corner of the afghan and is made in a triangular shape. Odd rows are worked using white, even rows are worked using second color, the shells increase in every odd row. 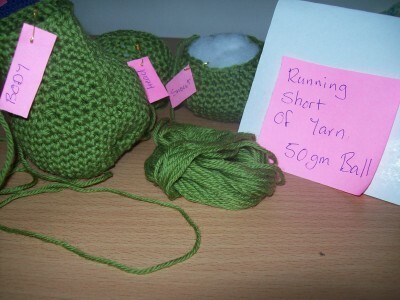 Always carry yarn that is not in use, when carrying yarn on odd rows, keep it loose as this yarn will be picked up in the next row when making the new space for the next set of shells. 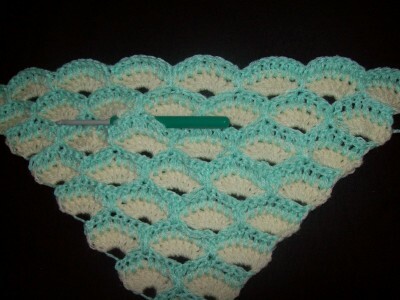 The shell is made up of 7 dc and is always worked in the back loop only. 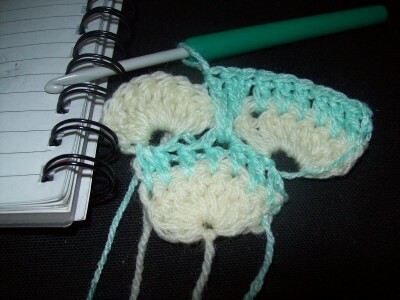 The chain 3 is not counted as a st through out the pattern. 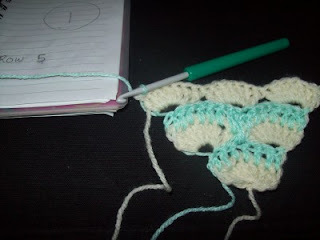 Continue on with pattern for length required, then begin decreasing. 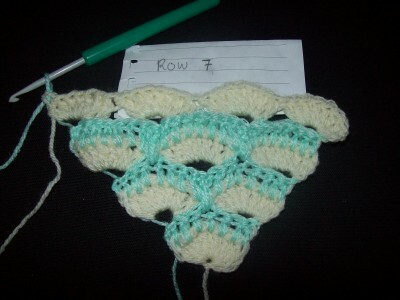 The shells of this pattern increase at each end of every odd numbered row, there fore they will also decrease in the same manner, at each end of every odd numbered row. 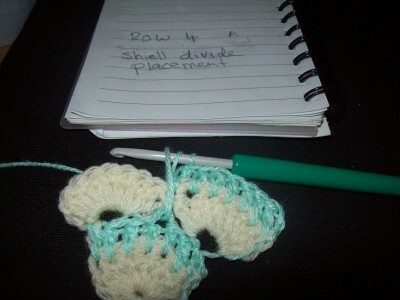 Decreasing is achieved by not making a new shell on either end of the row, you just go straight in and crochet the shell st in the space provided on each end. 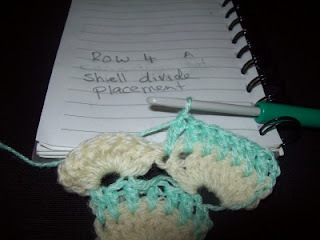 Do not make a new shell on either end, on the dc rows continue as normal. 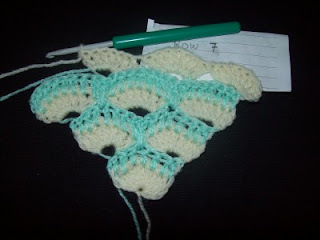 At the moment there are no instructions for a border. I carried my yarn on every row, I did think that it was possible to use 2 skeins of the secondary color, but when I did try that it would not work, take a look at this picture it explains it all. 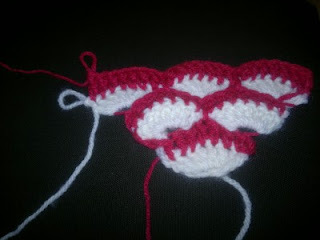 Both of the secondary colors are on the wrong end. 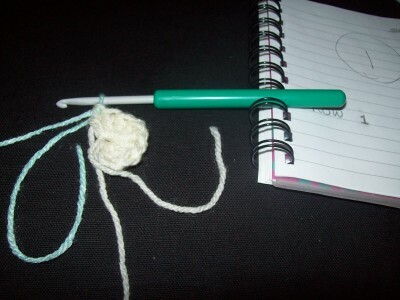 The picture below shows Lisa's technique. 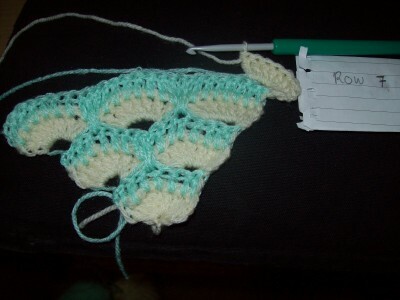 The 2 rows that form the pattern are actually made on the one side in the same direction. You crochet across with the white from right to left and leave the end loop, then with out turning your work you go back to the right of the row and crochet with the alternating color across to the left, now it is time to turn your work and repeat the above process. 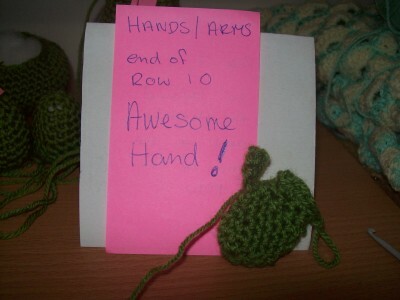 This ensures that you never have to carry any yarn and gives the same affect too. Silly me for not understanding Lisa's way, but I have made so many rows of my Afghan I do not want to frog it now. 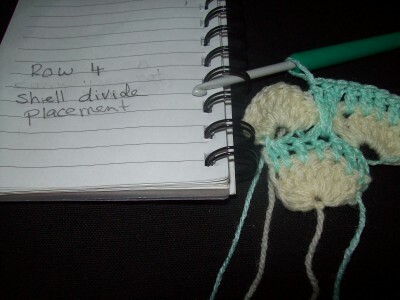 I cannot get the decrease to work neatly with this method. You will find 6 video tutorials for the beginning of this Afghan on my you tube channel, here is the first of the 6. This is the video tutorial for decreasing. 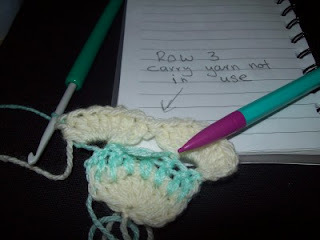 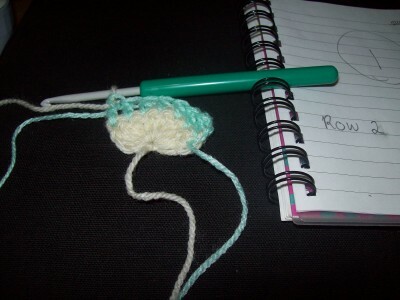 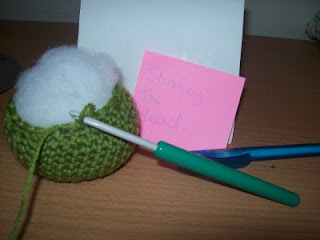 I was able to put together a short tutorial on the alternative method of no carrying yarn for this pattern, see below.